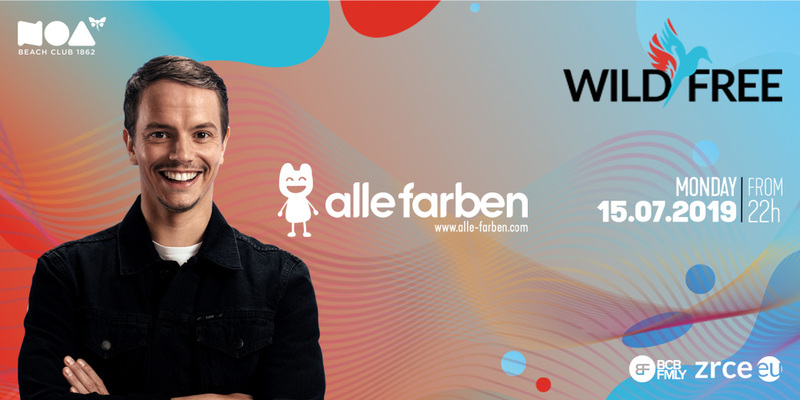 We’re super stoked to announce that Alle Farben is coming to Zrce Beach Wild&Free Festival on 15.07.2019 at Noa Beach Club! Gigs in front of 60,000 people, 2.5 million singles sold, four times nominated for the 1LIVE crown, three Time for the Echo, 2017 won the echo in the category „Dance National“, three times in a row Pole position of the airplay charts – this is Alle Farben! The Wid&Free Festival takes place from 13.07.-20.07. and had a huge lineup with acts like Alle Farben, Mike Williams, Brooks, Plastik Funk, Fabian Farell, Vol2Cat and many more! Exuberant party atmosphere in different locations on Zrce Beach. In 2018, the Wild & Free made a strong debut with international acts like Kungs, Tony Junior and Plastik Funk. In 2019 the Wild & Free will increase again!